I know some have told you that the way to take leadership, step up, and progress in manhood is to get married. However, I must differ. Marriage is the last thing some of you need to be thinking of just now. You need to grow up first. I affirm what I think these others are trying to say-start preparing yourself for marriage. Move “Halo” down your list of priorities in order to begin thinking about what sort of vocation you will pursue, how you’re going to pay your bills, etc. But much progress in this may be needed before you really start looking for a wife. If you are not right now getting your class work done, and fulfilling your comparatively light responsibilities as a single student, then don’t even consider the prospects of marriage. Instead start working on growing up. Our culture is infatuated with youth and encourages you not to grow up. After all, it says, the glory is in the youth. If you would be men, you must reject this siren song and swim against the tide. You must diligently seek to throw off immaturity and to grow up. Remember the one boy who never grew up was Peter Pan-and in case you haven’t noticed, his role has typically been played by a woman. The chase for perpetual youth is never manly. The other example of avoiding the effects of growing up is the medieval boys choirs. To maintain the high voices of the boys as they aged, the boys might be castrated. Again, avoiding maturity is emasculating. So my main point to you is work on growing up. It does not “just happen.” Examples abound of physically mature males who have never truly attained manhood because they failed to mature in any way other than physically. So, what does it look like to grow up in manliness? No doubt this could be discussed in many ways. I’ll just take a stab at several that I think are important based on my own reflections on scripture and my observations of the young collegiate men whom I teach. With our modern invention of “adolescence” (which now includes the college-aged male) you can be encouraged to float along without much real responsibility, just get by in classes, major in play, be a goof-off, sample the girls to whatever extent you can, and not really consider responsibility. However, if you would be a man you must shake off the doldrums. I enjoy life, like to laugh and to joke (even if not everyone appreciates puns! ), but that is different from being a total goof-off. It is not until there is a weightiness in your core that you really have the opportunity and the privilege to engage in playfulness, too. When I was in Scotland, there were a number of good guys who were there studying at the same time I was. We would get together at various times and have an ongoing conversation about the man of gravitas(Latin for “weightiness”). The word refers to a certain “bearing” or dignity. The man of gravitas is not one who cannot joke, but one who has a weightiness in what he says, one who has an opinion that matters based on his proven character. We must establish that. If we are not moving in that direction, then we are not maturing. Laugh when it is appropriate, but if you can’t be serious at the proper times you are immature. You don’t need to jeopardize any woman by talking about a serious relationship with her. Take seriously your current obligations. Learn and discipline yourself to complete your school assignments and to do them well. Be on time at work and in class. This may seem pretty basic, but it is an essential starting place. I challenge your manhood, right here, right now, if you are not, on a regular basis, getting your work done and turning it in on time. We say we want to take on the responsibility of leading a family or assuming leadership at a job, but we can’t do an assignment and turn it in? It starts with the small things. If we are faithful in little, we will be faithful in much. Reject the blame game. When the buck is passed, it is always done with a limp wrist. If you did not get your assignment done on time, own up to it and drop the lame excuses. Refusing to own your failures-playing the blame game-is an abandonment of manhood. You cannot lead and avoid responsibility at the same time. Face it like a man. If you simply did not discipline your time sufficiently to accomplish the task, don’t spin it with some religious sounding excuse. If your roommate was in a crisis, I am glad you were willing to stay up all night last night to talk with him. But your paper is still due today. You should not have waited until the last day to complete it. We see this at the Fall (Genesis 3). When God comes, he calls Adam to account, but Adam passes the blame to Eve. However, Paul makes it clear that the ultimate responsibility for the sin rested on Adam (Rom 5:12-21). Avoidance of responsibility is an old and pernicious sin which will neuter you. Fight it! God made you to work. Reject laziness. See laziness not merely as a foible but as damnable sin, a dangerous cancer that can eat away your soul. Laziness and avoidance of work is a typical sin for men, so wage a particularly diligent and merciless war against it in your own soul. Yes, work-aholism is another error that affects men, but the answer is not laziness. In fact workaholism is often a way of avoiding the really challenging work of caring for and leading one’s wife and children. Work is good and ennobling. If this is not the way you think, change your thinking to adopt this biblical view (Col 3:23). Reject the “live for the weekend” mentality. Instead, begin asking God and godly leaders what work He has for you to do. Find your calling. Yes, I know He created you for His glory, to be in relationship with Him and with others. But He also made you to work, and that work will be one main way in which you glorify God. For what task were you created? To what work will you commit yourself? You need to have some clear thoughts about this (not a full blueprint) before you can seriously consider marriage. Before you should take a wife you need to knowwhere you’re taking her. You need to know what you intend to do in life. O f course, God sometimes shifts things, and things change. But you need to have a goal. You need to know, to the best of your ability, under God, and in concert with godly, wise counsel, where you are headed. One of the most “un-manly” things you can do is whine. I am not saying, “Don’t admit weaknesses and seek help.” No. Do that. But I am talking about whining, about whining about how things are wrong for you instead of making the most of your situation. 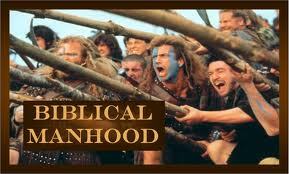 Part of manhood is initiative; so begin to practice this by seeking solutions rather than sniping and complaining. This produces leadership. The world will tell you life is found in freedom from any constraints, obligations, or commitments. It is a lie. What this leads to is purposelessness. We are often given the picture of manliness in the lone wandering hero. This is false. This aversion to commitment and obligations is actually just a form of cowardice. It is easy to play games and go through motions. In isolation you can keep your sins hidden, deceive yourself with an exalted view of yourself, and live in fantasy. The real work is in settling into specific situations, working out issues, helping people, having to face your own sins, deficiencies, and failures, and staying at it over the long haul. And, this is where real life is found. You are not a drifter born to walk alone. You were made for community. Of course, part of what I have in mind here is to begin thinking not of various women to entertain but of the prospect of settling down with a specific woman. They call it “playing the field.” Typically it’s just sin. Don’t toy with women. They were not created for your amusement. You know the stories of guys dating various girls, or at least keeping a number of girls “on the line,” giving them just enough interest to keep them close for whenever he wants to hang out with them. Guys like this need other guys to rebuke them and run them off. But, how do you begin this? How do you prepare? First, invest yourself in a local church. Learn there to live in community with other people, to build significant relationships, to work through problems, to express your needs and to meet the needs of others. The church is the training ground for life in general. Then learn the fact that commitment costs. Stand by your word. Realize that every decision to do one thing is a decision not to do several others. So do not simply clutter your life with miscellaneous things. Take responsibility and commitment to bring some focus to your life. What are you about? If you are going to invest your life into something that matters, you will have to make sacrifices. In the future, that will involve laying aside some things you would like to do in order to work around the house, to help your wife with some things that, in themselves, don’t particularly interest you, to lead your family. But that is in the future. For now, learn to live out of principle and not out of unbridled desire. Learn to say no to yourself. Also on this point, it is true that masculinity involves the idea that men protect women and children. I know this is terribly non-“PC” and, to many people, passé. That does not change the truthfulness of it, however. Nor does it change the fact that most women deeply appreciate this unless they have trained themselves not to. What does this kind of heroic sacrifice look like right now in the day-to-day life of young men in college? We will likely not face situations like the Titanicor the Birkenhead (though those men probably did not anticipate facing these situations either). It is worthwhile considering these grand examples, though, because the big picture effects how we act in the small things of life. Here are some ways we can live this out. Guys, take the risk in relationships. You initiate and make the approach. That way, she can be safe and does not have to take the risk of stepping out first. Also if she feels the need to break it off, she is free to do so even without explanation. You take the brunt of it and let her go unscathed. In a small way, you could include here opening the door for ladies, waiting for her to enter a door first, walking on the traffic side of the street, placing yourself between her and any potential danger, etc. I’ll close with this story. Just this last weekend my family and I had gone to the mall (which I sometimes consider part of my sacrifice). We have six children, two of whom are under two years old. As we left, in the cold, dark and drizzling rain, we realized we had two dirty diapers. So, as we told our four older children to file into the vehicle, my wife and I were side by side using the back of the vehicle as a diaper changing station. Instead of dueling banjos we had dueling diapers, working quickly in the cold and rain. But I thought, “No, that couldn’t be any further from the truth!” I was glad to get to go to the conference, but this is real life. The everyday labor with my family is far more heartening and joyful to me than any of those other things. This will have far more impact in God’s Kingdom. The everyday, inglorious work I do, the tasks of teaching, training, and changing diapers-that matters far more. For those of you who will marry, this is where you are headed. Manhood is embracing everyday responsibilities, living out commitment, being willing to sacrifice, so that your cultural engagement really happens in your family. The most significant culture you are involved in is your own home, your own church, living out practical godliness . . . with dirt and other items under your fingernails, so to speak. It is godliness in the everyday sphere of life. This is real manhood being lived out. Thank you. So real and true. This will be shared with my teenage sons!